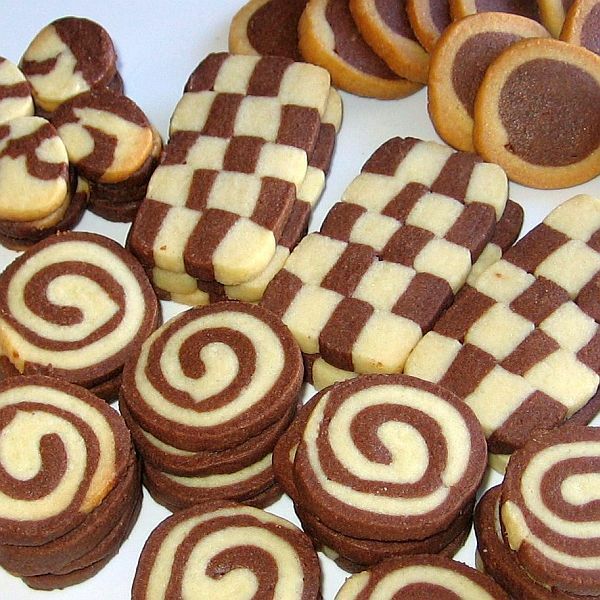 This easy recipe for Czech black-and-white cookies or linecke testo dvoubarevne (lih-NETS-keh TAYS-toh dvaw-oo-bah-RREV-nay) can be made into zavitky (pinwheel), sachovnice (checkerboard), kolecka s obrouckou (wheel), rezy ze cytr pruhu (square), and salam (salami) shapes. These mildly sweet cookies are often served at Christmas when they become part of vanocni cukrovi (vah-NAWTCH-nee koo-KRAW-vee) or Christmas sweets. They look best if left light with just a little browning around the edges. Here's a larger black-and-white cookies photo. In a large bowl, cream the butter and sugar until light and fluffy. Add the egg and vanilla and mix thoroughly. Add the flour and work into a smooth dough. Divide dough in half and mix cocoa powder into half the dough. You may roll immediately between waxed or parchment paper but refrigerate before cutting for more even strips. For Checkerboard Cookies: Roll out each portion of dough between waxed or parchment paper into a 1/2-inch-thick rectangle. Refrigerate dough on a flat surface for 30 minutes or so to make cutting easier. Cut each rectangle horizontally into 1/2-inch-wide strips. Lay 5 strips of alternating color on a piece of waxed or parchment paper, making sure they touch each other. Then over the first layer, place the second layer of strips, alternating the colors, and then the third layer on top of this, alternating the colors (you can add a fourth layer if you like). Wrap in plastic wrap and refrigerate 2 to 3 hours. Heat oven to 350 F. Slice into 1/4-inch cookies and place on a parchment-lined baking sheet pan and bake 10-15 minutes. For Pinwheel Cookies: Roll out each portion of dough between waxed or parchment paper into a 1/8- to 1/4-inch rectangle. Lightly brush one rectangle with egg white. Lay the contrasting color rectangle of dough on top and roll up. Wrap in plastic wrap and refrigerate 2 to 3 hours. Heat oven to 350 F. Slice into 1/4-inch cookies and place on a parchment-lined baking sheet pan and bake 10-15 minutes. For Wheel Cookies: On waxed or parchment paper, roll light or dark dough into a 1-inch-thick cylinder. Roll out contrasting-colored dough 1/4-inch thick. Lightly brush with egg white and wrap around the cylinder of dough. Wrap in plastic wrap and refrigerate 2 to 3 hours. Heat oven to 350 F. Slice into 1/4-inch cookies and place on a parchment-lined baking sheet pan and bake 10-15 minutes. For Square Cookies: Roll out each portion of dough between waxed or parchment paper into a 3/4-inch-thick rectangle. Refrigerate dough on a flat surface for 30 minutes or so to make cutting easier. From each rectangle, horizontally cut 2 strips 3/4-inch-wide. Place a light and dark strip next to each other. Lightly brush with egg white and place remaining 2 strips in reverse order on top. If desired, reserve some dough (either color) and roll 1/4-inch thick and wrap around the length of the square, giving it a border. Wrap in plastic wrap and refrigerate 2 to 3 hours. Heat oven to 350 F. Slice into 1/4-inch cookies and place on a parchment-lined baking sheet pan and bake 10-15 minutes. For Salami Cookies: Press small leftover scraps of light- and dark-colored dough together and roll into a 2-inch-thick cylinder. Wrap in plastic wrap and refrigerate 2 to 3 hours. Heat oven to 350 F. Slice cylinder into 1/4-inch cookies and place on a parchment-lined baking sheet pan and bake 10-15 minutes.